In our cities and communities probably more than a hundred thousand domestic pigeons live in winter. It is thought that the domestic pigeon was the first foreign bird species to become naturalised in Estonia. Originally brought here as domestic birds from Germany they were already in the beginning of the 20th century inhabitants of our cities; thus the domestic pigeon today is held to be a native species. All know the domestic pigeon that keeps close to human settlements. The basic colour of the upper parts is dove grey, the rump area white, upper side of wings grey with broad characteristic bands and the undersides light. The tail is grey, dark at the tip and in flight usually spread out like a fan. The crop area and breast often has a metallic sheen. Eyes dark red, beak dark grey, legs pink. A sure species identification mark is the white tail base.. Domestic pigeons have developed from the rock dove (Columba livia), and from carrier pigeons escaped from dovecotes; thus the colouring varies widely – from white to nearly black. Domestic pigeons can become almost a pest in some feeding places, because they will not leave until the food is all gone. 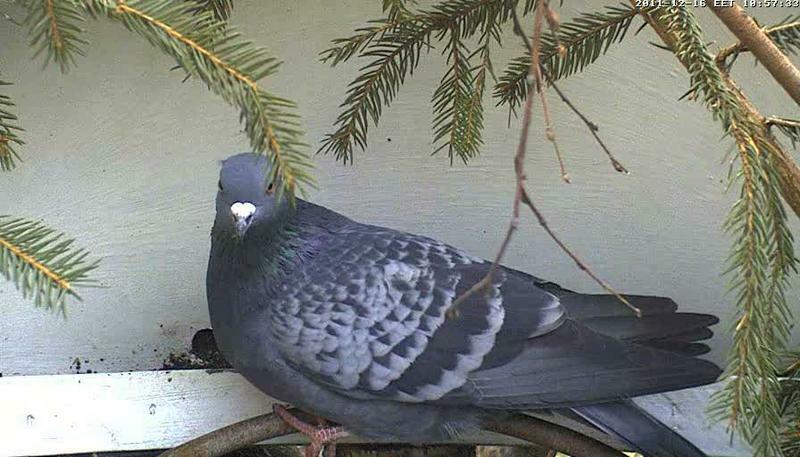 Arne has tried to make access to the feeder uncomfortable for pigeons at Otepää but we are not going to scare them off – after all, they are part of the bird world in nature.